To buy in person, go to the Scout Store at Pouch Camp at 1465 Manor Road. If you tell them you are a new scout in Pack 37, they will get you everything you need. 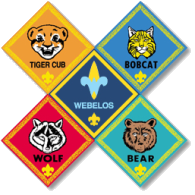 Please note that you do not need to buy the Webelos neckerchief. The Pack will provide that to you. * The Pack may have Council Patches and other standard patches in stock. Check with the Cubmaster or Committee Chair for availability.